LG Optimus L Series II phones break cover before MWC | What Hi-Fi? 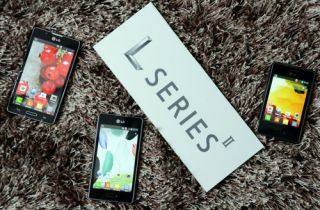 LG has announced its latest Optimus L Series II smartphones, due to be officially launched at Mobile World Congress in Barcelona later this month. The Optimus L7II, the first in line of the incoming Series II handsets, will be arriving on UK shores in the Spring. It sports a 1GHz dual core processor with 4GB ram, a 4.3-inch IPS display, Android 4.1 Jelly Bean OS, an extended battery capacity of 2460mAh and rear and front facing cameras (rear 8mp camera). It will be joined later in the year by the Optimus L3II, a 3.2in-screen phone, and an Optimus L5II, which sports a larger 4in display. Upgrading from the Optimus L Series to the L Series II, the Series II will offer an expanded set of features such as Quick Memo, Quick Button and Safety Care. Quick Button enables customers to personalise a hotkey to launch any app while Safety Care offers the choice of three options: Emergency Call Forwarding, Phone Non-Usage Notice and My Location Notice. Dual SIM versions of the Optimus L Series II smartphones will enable customers to use one device for both business and personal calls. We will once again be reporting live from MWC, which gets started on Monday 25th Ferbuary. HTC, LG, Samsung, Sony et al. will all be showcasing new smartphone and tablet products, not to mention plenty of portable speakers and other mobile accessories.